After the funeral for yet another member of Richfield United Methodist Church earlier this year, nine of the 12 remaining members of this rural 111-year-old church (the other three are homebound) got together to discuss their future. By many metrics, the church was still vibrant. It had a healthy $90,000 balance in its treasury; it regularly contributed to the local community, collecting food and school supplies; it was proud of its near-perfect attendance record. Unless someone was sick or in a nursing home, every member could be counted on to be at church on Sunday mornings. But the colonial brick building in the central region of North Carolina had not drawn new members in more than a decade. The two textile mills in nearby Albemarle had long closed, and a mill in the town of Richfield had shuttered. With no industry and few jobs, the small community of 600-plus residents was unlikely to grow. Fortunately, the Western North Carolina Conference of the United Methodist Church, to which Richfield belongs, last year launched a project funded by The Duke Endowment to help declining congregations take a hard look at their future prospects and consider their options. The Church Legacy Initiative, as it’s known, is a novel experiment that helps declining churches chart their end and leave behind a lasting gift. A sort of “hospice care for churches,” a dozen or so similar programs have started in various United Methodist conferences across the country, and other independent nonprofits have begun to offer similar services. These programs meet a critical need. A 2012 study by Donald R. House found that while the United Methodist Church has suffered through decades of declining worship attendance, the rate of decline has increased markedly since 2002. By 2030, an estimated 30 percent of the denomination’s churches -- or about 10,000 congregations -- will have closed. 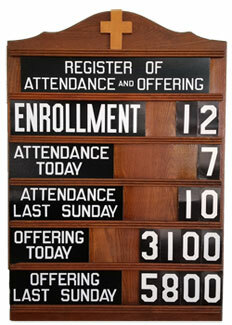 Richfield UMC's updated register sign. Most of those congregations are very small. In the United Methodist Church, roughly 40 percent of congregations had fewer than 35 people at Sunday worship in 2015, according to statistics from the UMC General Council on Finance and Administration. (Those congregations account for about 9 percent of all UMC churchgoers.) The landscape is much the same in the Western N.C. Conference, where more than 500 of the conference’s 1,100 churches have an average attendance of fewer than 50. Other mainline churches face similar realities. Using a small self-reported sample, Ed Stetzer, the Billy Graham Professor of Church, Mission and Evangelism and executive director of the Billy Graham Center for Evangelism at Wheaton College, estimated that 3,700 Protestant churches in the United States closed in 2014. Many other churches, it’s safe to assume, are barely hanging on. The financial drain of dying churches is hard to estimate; even harder to calculate is the burden -- and anxiety -- these churches impose on mostly elderly church members who are left to pay the bills. The question for many denominational leaders is how to help declining churches make decisions while they still have some agency and an ability to shape their future. While no church wants to reach a stage where it requires terminal care, Sorrells said the services offered through the program are a way of honoring a congregation’s life at the very end, much like hospice in a healthcare setting. Of the 3,700 or so Protestant churches that closed last year many likely did so suddenly and under duress, with little or no planning -- landing on a stretcher in the emergency room, as it were, without health insurance. Perhaps the church had become unable to pay its bills, service its debt or finance critical maintenance repairs to its facilities. In any case, such events would necessitate swift action on the part of its denomination, with officials, in essence, forced to issue a death certificate. Church legacy programs are intended to offer care before it’s too late. That’s not an easy thing to do, especially in a culture loath to name death, much less talk about it. Still, the reality is that churches close all the time, said Stetzer, who has called for the creation of a “hospice” ministry for churches. The particular churches mentioned in the New Testament are no longer in existence. Christians know this, but they haven’t internalized it. Where is your church in its life cycle? What does that mean for its ministries? Church legacy programs are intended to start the conversation, said the Rev. Cate Noellert, a California pastor who chairs the Legacy Church Project created by the Texas Methodist Foundation to help denominational leaders start their own programs. Noellert has her own consulting ministry, Liminal Grace, which includes working with congregations in the process of closing. “Legacy work is about coming in before [churches] get down to the bitter end and offering them a better end -- the idea of finishing well and finishing strong and doing that with more care, with more empowerment -- giving them the chance to close of their own accord and leave a legacy for the future,” Noellert said. Legacy programs can also assist with the many details that follow a decision to close: setting up a legal entity to provide for the ongoing care of a cemetery, drawing up lists of items to donate, closing bank accounts, transferring control of the building to a company that helps maintain the property after the church has closed. If your church closed today, how would it be remembered? “People really care about, ‘How will people remember us? Will we be known as the church that closed this year, or will our longer, larger story be told?’” Noellert said. Some churches may want to create a book or a video to memorialize their work. Others may want to donate their reserves toward a ministry they have long funded -- a camp, a halfway house, a ministry for disabled children. Still others may want to use proceeds from the sale of the building (which in the United Methodist system returns to the conference) to seed a new church. The dozen or so United Methodist conferences that have started legacy programs have each compiled criteria for identifying dying churches. After drawing up an inventory of churches meeting those criteria, the conference consults its district superintendents to identify churches with enough energy and leadership to participate in the program. Some regions, such as the Florida Conference, present churches with an option of revitalization, too. What does Richfield UMC's story say about failure and success in ministry? Church closure is not necessarily a sign of failure. Many congregations, such as Richfield United Methodist, are victims of changing demographics. The collapse of local industry and the migration of educated millennials to large urban areas can create challenges for rural congregations -- especially when they are located in areas with an overabundance of churches, built long ago to be within an easy walk or horse ride for worshippers. In any case, legacy program leaders say church closure is theologically consistent with Christian faith, which teaches that death is followed by new life. Just as Jesus rose from the dead, so too dying congregations can give birth to new ministries, either by turning over their buildings to younger groups or by selling the property and funding new church plants or ministry projects through the proceeds. In what ways does a building help or hurt a church's efforts to make new disciples? Legacy programs also work hard to make sure members of dying churches find a welcoming home in a new congregation. Wanda Stilwell of Monroe, North Carolina, was “welcomed with open arms” at Mineral Springs United Methodist, which she joined alongside seven other church members from Hebron United Methodist, a church that closed last year with the help of the legacy project. Her new church has Sunday school classes, Bible study, a choir, a quilting group, a prayer group and multiple mission opportunities -- none of which her shuttered church had offered in years. Best of all, she said, her 13-year-old grandson, Trystan, has been welcomed into the youth group at Mineral Springs UMC. Where are signs of life at your church? Where are signs of death and decay? The members of Richfield United Methodist chose a longer-than-usual time frame to complete their closure process. After meeting with leaders of the Western North Carolina legacy project, the church decided it would remain open until July 2018, holding its last service on homecoming Sunday. The extra year would allow its members to go out, not with a whimper but with a bang. And then there are two big items on the list. The church wants to finalize the transfer of the parsonage to Pfeiffer University, a private liberal arts school affiliated with the United Methodist Church. The school will use the parsonage as a dormitory for students studying early childhood education and wanting to train at a nearby elementary school. The church is also in talks with the district superintendent about repurposing the church building as a resource center for the community. One idea is to convert the building into a kitchen or warehouse to provide meals for elderly residents. Sorrells, who facilitated two conversations with the church members, said he wasn’t sure how they would vote, given the level of energy they still had for ministry. Ultimately, they saw that in closing, the church could offer more to the community than in remaining open. “They’re going out as a vital congregation that still has life after death,” said the Rev. Jim Groome, the church’s former pastor. That doesn’t take away the grief many members feel. Zina Risley, who joined the church 13 years ago, said she loves the intimacy and the openness with which members shared their lives. Back when men and women had separate Sunday school classrooms, she could hear the men cackling on the other side of the wall. It wasn’t hard to figure out who was up to what. Risley and her husband, John, will likely transfer their membership to New Mt. Tabor United Methodist after Richfield closes. But the lessons of “the tiny church that could” will always remain. What does Richfield UMC's story say about the nature of failure and success in ministry? In what ways does a building help and hurt a church's efforts to make new disciples? What new ways might be more effective? Where do you see signs of life at your church? Where do you see signs of death and decay?